When we heard that MA Fine Art alumnus Ekkehard Altenburger had been awarded a prestigious commission for Volkswagen Financial Services, we wanted to learn more about the project. 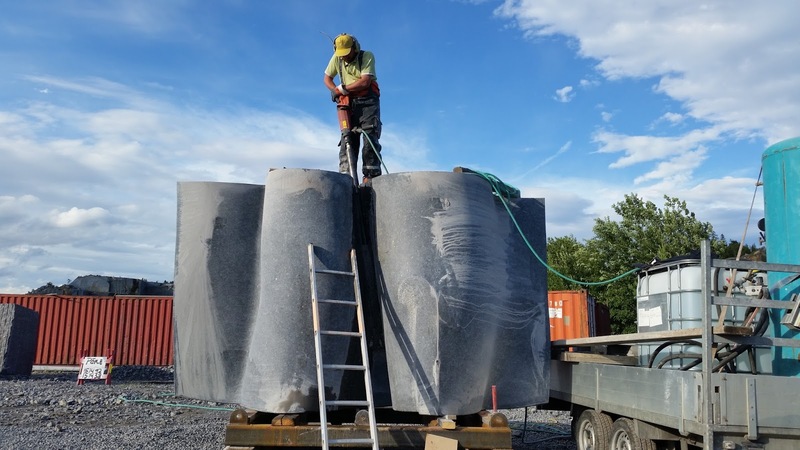 Starting life in a Norwegian granite quarry in Larvik, Thoughts in a Banked Curve is a large scale work which has taken 3 months to sculpt from a 30 ton solid block of granite. We caught up with the artist to discuss the mammoth project he has undertaken and to gain an insight into his experiences of the Chelsea MA Fine Art course. Firstly, how did the opportunity for this particular commission come about? It was an open competition, and I first got short listed on the basis of previous work and public art commissions I have been producing over the past decade. I was the winning artist from a short-list of four. Undeniably, this is a huge work to undertake. Tell us about the experience of developing this project. 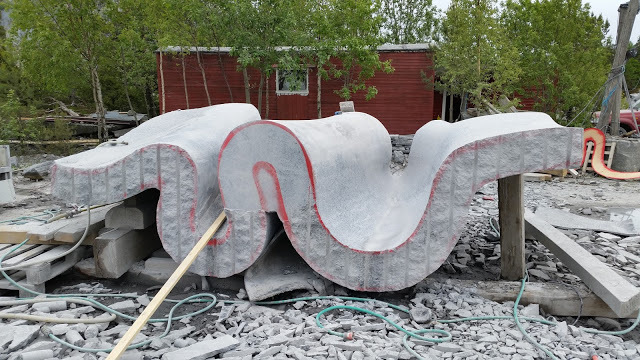 I have produced quite a number of public works in the past, and therefore have quite an extensive knowledge and experience in producing large-scale sculpture. For large-scale works like this one, I will usually produce them abroad, as my London studio is simply not set up to deal with weights up to 30 tons. I usually gather a team together, or work with specialised contractors but always produce the work myself, so my involvement in the production is very much “hands on”. In this case, I chose to work with a quarry I have previously worked with. 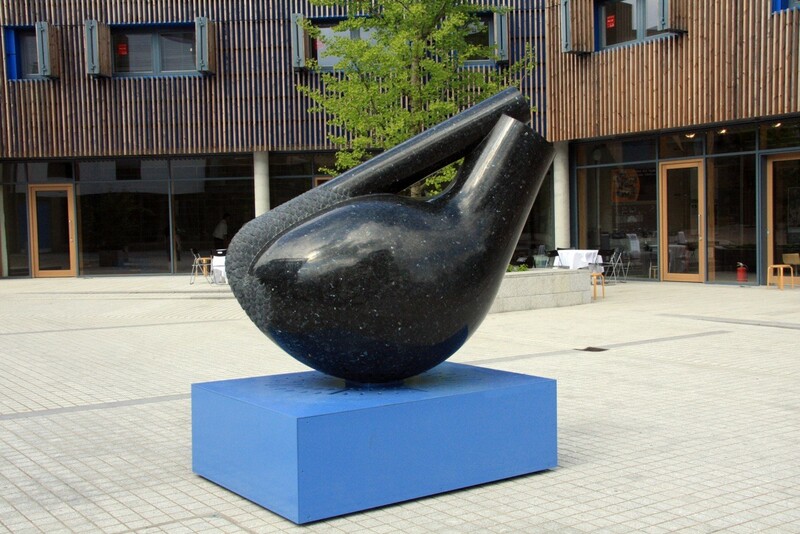 In 2011 I produced a work for the Harlow Arts Trust and there I have used this granite for the work Sophrosyne/1. 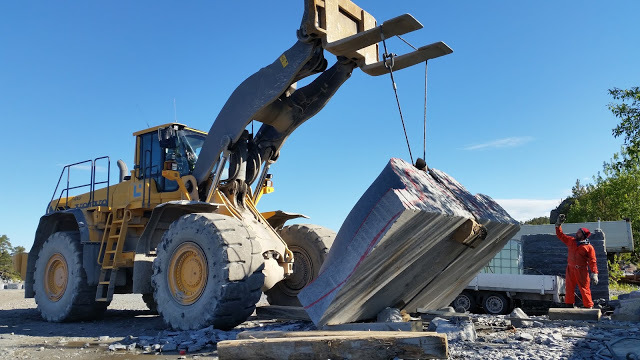 As I needed a large scale block with no faults, the choice very quickly gets limited, and I knew, that this quarry could provide the type and quality of material needed. Do you feel that completing an MA Fine Art course here at Chelsea prepared you for these types of commissions? Personally, I think it would ask simply too much of any fine art course to prepare for such a project. I would have struggled even 10 years ago, it simply takes time and lots of experience to come to such a point in ones career. In addition, I had to build up all the contacts I have over the past 15 years to be able to produce the work. On projects like these, I only work with people I have worked previously, as everything is complex, and I need to be able to trust the people I work with. Tomorrow I will be in Carrara , Italy, to start the work on the marble plinth that the piece will rest on. Here, I will again work together with people I know from a previous project, produced in 2012 for the University in Nottingham called House for a Gordian Knot. And finally, how did you find your experience of the MA Fine Art course? I am very happy that I went to Chelsea. I couldn’t say it was an easy time, and I certainly needed a couple of years to find my own voice, but it prepared me mentally as well as intellectually for the time after graduation. I think, it provided me with a toughness, which helped me through some tough times later in my artists life, and for that I am grateful. 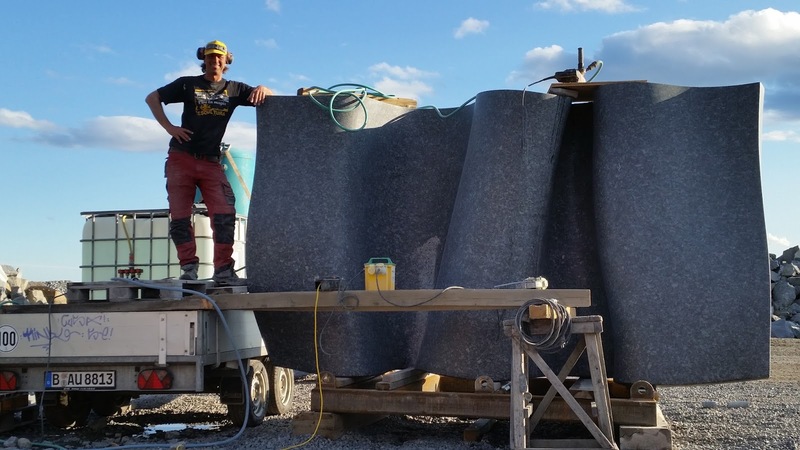 Ekkehard documents the mammoth task of producing his large scale granite sculpture on a detailed and personal blog, and plans for the finished work to be installed in the beginning of October. Check out Ekkehard’s blog for the story behind the production of this large scale project. See Ekkehard’s website for further examples of his work. Read more about studying MA Fine Art at Chelsea.